We offer a reliable and professional service based on 23 years' experience. All work carried out to British Standard 3998, NPTC Certified. £5 million Public Liability Insurance. Felling, crown reduction/lifting, pruning, hedge cutting and logs. Domestic and commercial work undertaken. Site always left clean and tidy. Applications made on behalf of client for trees protected by preservation orders (TPO's) and conservation areas. We would highly recommend using Hands on Tree Care. Very professional, friendly and efficient. I called a few tree surgeons about pruning a beech tree and Tony returned the call promptly and called round to quote the following day. He talked me through the job in detail and answered all my concerns about insurance and health and safety. On the day, they turned up at the arranged time and worked tirelessly through the day. All waste was removed, we didn't need to clean up anything. The tree is large and now looks fantastic, even our neighbours have commented how good it looks. Very friendly. Nothing seemed too much trouble. They even chopped some branches into logs for us ready for a log burner we told them we were hoping to install. Price was also fair as well. I will definitely be using this company again in the future. The company took down four trees for me. They gave an efficient and friendly service, and left everything clean and tidy. I would highly recommend them. We recently had a tree taken down together with removing a branch from another tree, by Tony and his colleague. They worked competently and efficiently and nothing was too much trouble for them. They were polite and friendly and always smiling, They we re careful with existing plants and left the garden neat and tidy. 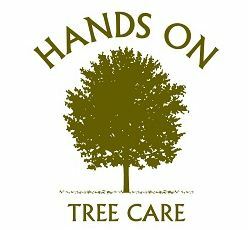 This is the second time we have used Hands on Tree Care and would recommend them to anyone. Very well satisfied. Did a good job. Would recommend. Tony arrived on 22nd August to top and prune back several conifers and a laurel. He and his partner did a wonderful job in resolving the branches overhanging the public footpath. They tidied all the cuttings away after them, with very little mess. I have now engaged them for some further work in October, and I have no reservation in recommending their services. Excellent work, the team were polite friendly and tidied up after themselves so you would hardly know they had been except that now I have light flooding my garden now that the trees are gone. Would heartily recommend them. Tony came on time and did an excellent job cutting down the tree. Was very pleasant and courteous. Highly recommended. From initially telephoning Tony, he came to give a quotation the next evening. The tree was removed, all taken away and the area left immaculately tidy. He was very pleasant and polite and did an amazing job. I would recommend him most highly.